ACU has been proud to call Abilene home for over 100 years. True, Abilene may not have all of the entertainment, shopping or recreational options that bigger cities might have – but we like to think that Abilene has a bit more charm, character and hospitality than some of the bigger sister cities. 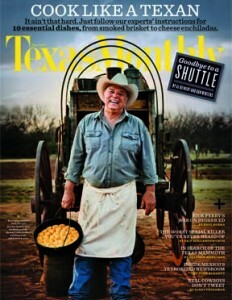 April’s issue of Texas Monthly features the restaurants and shops of downtown Abilene, and even has Tom Perini – of Perini Ranch Steakhouse in Buffalo Gap – on the cover. Stan Smith (ACU Class of 1975) is the Events Manager at Perini’s. I called Perini’s to see if I could interview him and ask him a few questions – but he’s currently in New York, preparing for and catering a few top secret events at the moment. Check out the piece about downtown Abilene here. And click on over to see a sneak peek of the April issue here. What was or is your favorite place to eat in Abilene? And if you’re planning a campus visit sometime soon, to see your current student or to bring your prospective student, be sure to check out some of these delicious dining establishments.